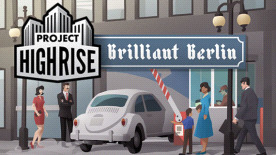 This product requires the base game Project Highrise. Willkommen in Berlin! This city has experienced profound change during its turbulent history. Yet through it all Berlin is still Berlin. Its spirit and elan have endured to create an astonishing, heady mix of artistry and industry that looks to a bright future while remaining ever-mindful of its past. Having reclaimed is role as the capital of Germany, Berlin is now evolving into the worldís reigning capital of cool. In Brilliant Berlin, youíll be challenged to adapt and keep up with the diverse needs of this thriving global city. To succeed in Berlin, you will need to build towers brimming with art, amenities, and elegance to lure in discerning tenants. Brilliant Berlinís new offices and apartments are a cross-section of the cityís population. From software engineers crafting code that will define the next tech trends to the global headquarters of major auto manufacturing firms, youíll create office space to accommodate a wide spectrum of Berlinís diverse and expanding economy. With apartments specially designed for families and children, youíll have a hand in ensuring that Berlinís future is a bright one. These new office workers and apartment dwellers will expect a suitably apportioned building, so make sure to pay attention to their likes and dislikes to maximize your profitability. Brilliant Berlin expands the impact of your influence and consultants with new art museums, political offices, union halls and tourist centers. Youíll deploy these to create more efficient and prestigious developments. Youíll need to provide ample parking for your new Berlin offices and apartments. New German restaurants coupled with sleek art-deco lobbies and artworks will firmly establish your buildingís Berlin bona fides. Top off your new towers with greenspaces in the sky with enticing rooftop decorations, and end your workday with a lager at one of your classic German beer halls. Prost!